For your all your locksmith needs, call Keylink Supplies & Services, where we offer 24 hour service to suit our customers at home, in the office or while you are on the go. 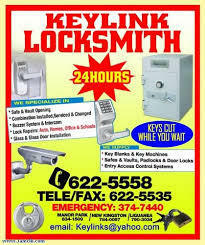 Keylink Supplies & Services offers professional locksmith services. We are focused on making you feel ‘safe and secure’. Regardless of the time our experienced team can assist you. Come in or call, we have the keys to solve your security problems. Key Link supply and service is a premier locksmith company providing superior standard solutions for lockout requirements. Our professional emergency locksmith in Kingston Jamaica ,deals with lockout-related problems year-round. From handling emergency access to the installation of high-quality security locks, . When you find any issues with locks and need immediate assistance, Key link supply and service should be the one that will fix your lock issues leaving you to deal with your daily life. Our emergency locksmith services in Kingston guarantee that you will receive the locksmith services from a professional 24/7 every day.